As recently as last week, US soccer fans had been alerted to another dual-national youngster that could step up for the national team: Julian Green. Green is a forward and a youth squad player for non other than the famed Bayern Munich of the German Bundesliga. 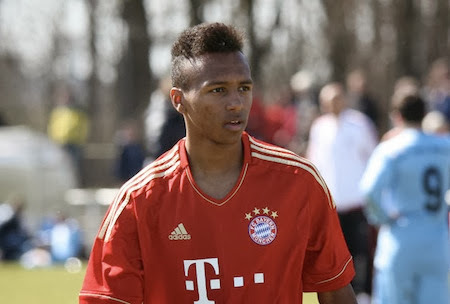 Julian Green was born in Tampa, FL to an American father and a German mother and holds two passports: USA and Germany. If this sounds familiar it's because we've seen this play out with Jermaine Jones, Danny Williams and Terrence Boyd. All had a choice between Germany and the US and joined the US team. Not much differentiates a player like Terrence Boyd (formerly of Borussia Dortmund, now with Rapid Wien) from Green. Both from storied clubs, both in their developmental teams, both eligible for two different countries. And whereas Boyd never took part in German youth squads, Green has already participated in 6 such games. Thinking back, plenty of players have played for teams other than the United States and still have wound up playing for Team USA: Jermaine Jones (Germany), Edgar Castillo (Mexico), Mix Diskerud (Norway). However, some notable exceptions are Neven Subotic (Serbia) and most famously Giuseppe Rossi (Italy). The latter was born in New Jersey and was invited by Bruce Arena prior to Germany 2006. Where does this leave Green, Germany and the US? Green should be called up sooner rather than later, hopefully in January if he's available. I doubt the March friendly will count and after that we will wait until after the World Cup. And therein lies the problem. If Green has a breakout performance and impresses enough, he could be called up in September 2014 for Euro 2016 qualifiers for Germany, thereby tying him to the German squad. Green's next chance to be cap-tied to the United States does not come until summer 2015 at the Gold Cup. Still, plenty of time for call-ups to friendlies and for filing his one-time switch in FIFA nationality. That's right, having played for U19, he now must make an official switch. Another kink might be if Germany calls him up for the U23s for the Olympics. The plot thickens. In the end, it really is a missed opportunity to see the youngster at least train with the national team. He would only have been able to train in the November friendlies given that he has not filed his one-time switch. As I see it, it's doubtful he will train, let alone play with the national team for many months to come. Until then it is up to Klinsmann and US Soccer to keep him engaged. The last thing we need is another Rossi. Then again, Danny Williams hasn't been called up recently and Terrence Boyd, for all his potential, has yet to score.